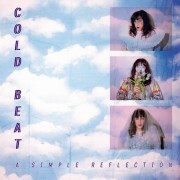 Cold Beat is a San Francisco-based quartet fronted by Hannah Lew (synths, vocals) with Kyle King (synths, guitar), Luciano Talpini Aita (synths) and Sean Monaghan (guitar). Formed in 2013 the band has released three albums and two EPs. ‘A Simple Reflection’ is a 7-song collection of Eurythmics covers, yet feels just as personal as any of their original material. While digging through a collection of 12″s for her record shop Contact Records, Lew stumbled across the earliest Eurythmics B-sides and was floored. This lead to the discovery of their debut album ‘In The Garden’. Annie Lennox’s abstract and poetic lyrics really struck a chord with Hannah. What had started out as a single cover quickly snowballed into a full blown obsession. The synth and drum programming resonated with her songwriting process, so reimagining them was very creatively fulfilling. The covers on this EP are simultaneously dynamic and atmospheric post-punk that plays to Lew’s ethereal vocals and King’s crystalline guitar.